In a way this article is a response to a question I got from Ryan on the Faebook Page of the SuppVersity a week ago. He asked, whether I had an article on Pentadecapeptide BPC-157, a substance of which he’d heard that it can accelerate tendon and muscle repair and work all sorts of other healing magic. Now, as a regular at the SuppVersity you may know that I didn’t have an article on this agent a week age. So I decided to write one. Not just because Ryan asked, but also because of the practical significance of the healing effects of this peptide from in vitro and in vivo studies (no medical advice here!). Figure 1: All markers of inflammation and muscle repair were sign. elevated with oral BPC-157(solid live) vs. control treatment with saline (dashed line) treatment in a model of muscle injury (Brcic. 2009). bone healing in rabbits who suffered an experimental segmental bone defect before being treated with BPC-157 (Šebečić. 1999). Cool? Well, I guess your next question is: “What’s the necessary dosage?” If we use the existing rodent data as a yardstick, the answer to this question is ca. 5µg/kg body weight (Novinscak. 2008; Cerovecki. 2010). That’s ~400µg per day for an 80kg man and thus roughly what you will see people on the Internet say they use. Want to listen to me explain the study? Plus: Update! Download yesterday’s installment of the SuppVersity Science-Round-Up at SuperHumanRadio.com | click here to download! On another note, after this article was originally published I received word from someone who claims to know the researchers who did the original studies and cautions against putting to much faith into their results… that is yet not the main argument for me; rather than that I am only skeptically optimistic, because no human studies have confirmed the efficacy of the compound. Without a human study that would conform that you need that much / that much little is sufficient, it is yet impossible to provide a science-backed recommended dosage for optimal effects at minimal side effects (chronic consumption not suggested, yet | learn why). Figure 2: Pevec et al. 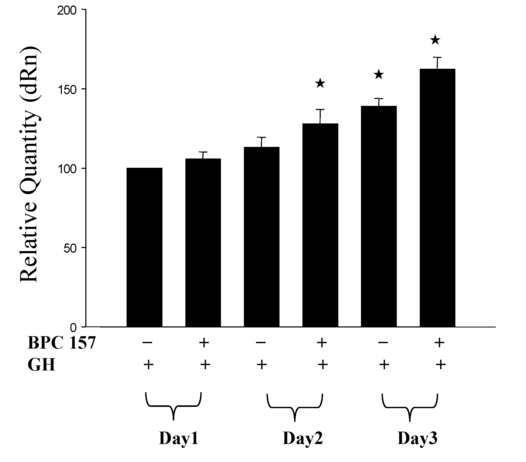 didn’t just observe that BPC-157 blocked the ill effects of corticosteroids on muscle healing, they also found that BPC-157 alone super-charged the healing process (Pevec. 2010). Ah, and before you ask: Yes, the peptide can be administered without a peptidase inhibitor or other agent to increase absorption and reduce breakdown, because it is a gastric juice peptide (Sikirić. 1993), or rather a part of it, namely a 15 amino acid fragment “with apparently no sequence homology with known gut peptides” the effects of which appear to be mediated “at least by the hormones of the adrenal, parathyroid, thyroid and ovarian glands” (Sikiric. 1994). BPC-157 should stack well with GH as it potentiates its effects on tendon repair (Chang. 2014). So why didn’t my doctor prescribe this? 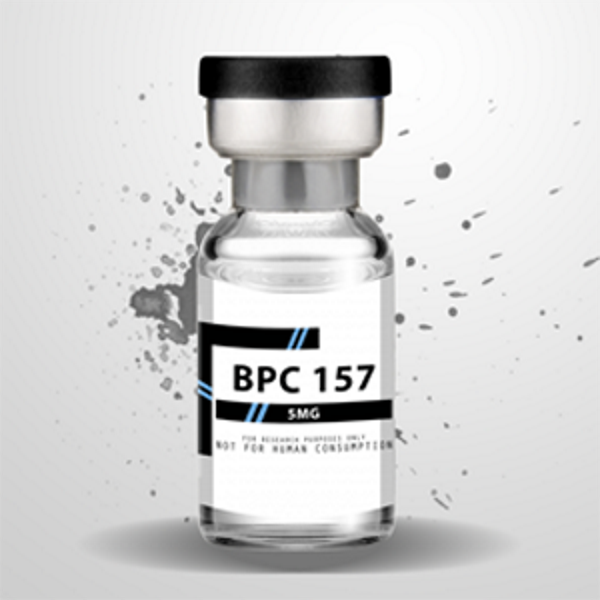 As gastric juice peptides, BPCs – including BPC-157 – are not patentable. Therefore, they are not interesting, and thus not produced or marketed by pharma companies (so your doctor probably doesn’t even know about their existence) and thus not available as FDA regulated drugs. The lack of money one can make from this agent is probably also the reason there’s still relatively little research on this compound; and I fear that this is not going to change very soon… it is thus probably more a question of money than one of time when and if we will see the human studies we need to decide if its effective+safe in man | Comment! Brcic, L., et al. “Modulatory effect of gastric pentadecapeptide BPC 157 on angiogenesis in muscle and tendon healing.” J Physiol Pharmacol 60.Suppl 7 (2009): 191-196. Cerovecki, Tomislav, et al. “Pentadecapeptide BPC 157 (PL 14736) improves ligament healing in the rat.” Journal of orthopaedic research 28.9 (2010): 1155-1161. Chang, Chung-Hsun, et al. “The promoting effect of pentadecapeptide BPC 157 on tendon healing involves tendon outgrowth, cell survival, and cell migration.” Journal of Applied Physiology 110.3 (2011): 774-780. Chang, Chung-Hsun, et al. “Pentadecapeptide BPC 157 enhances the growth hormone receptor expression in tendon fibroblasts.” Molecules 19.11 (2014): 19066-19077. Keremi, B., et al. “Antiinflammatory effect of BPC 157 on experimental periodontitis in rats.” Journal of physiology and pharmacology 60.7 (2009): 115-122. Krivic, Andrija, et al. “Achilles Detachment in Rat and Stable Gastric Pentadecapeptide BPC 157: Promoted Tendon‐to‐Bone Healing and Opposed Corticosteroid Aggravation.” Journal of orthopaedic research 24.5 (2006): 982-989. Novinscak, Tomislav, et al. “Gastric pentadecapeptide BPC 157 as an effective therapy for muscle crush injury in the rat.” Surgery today 38.8 (2008): 716-725. Pevec, Danira, et al. “Impact of pentadecapeptide BPC 157 on muscle healing impaired by systemic corticosteroid application.” Medical Science Monitor 16.3 (2010): BR81-BR88. Šebečić, Božidar, et al. “Osteogenic effect of a gastric pentadecapeptide, BPC-157, on the healing of segmental bone defect in rabbits: a comparison with bone marrow and autologous cortical bone implantation.” Bone 24.3 (1999): 195-202. Sikirić, Predrag, et al. “A new gastric juice peptide, BPC. An overview of the stomach-stress-organoprotection hypothesis and beneficial effects of BPC.” Journal of Physiology-Paris 87.5 (1993): 313-327. Sikiric, Predrag, et al. “The beneficial effect of BPC 157, a 15 amino acid peptide BPC fragment, on gastric and duodenal lesions induced by restraint stress, cysteamine and 96% ethanol in rats. A comparative study with H 2 receptor antagonists, dopamine promotors and gut peptides.” Life sciences 54.5 (1994): PL63-PL68. Sikiric, Predrag, et al. “Toxicity by NSAIDs. Counteraction by stable gastric pentadecapeptide BPC 157.” Current pharmaceutical design 19.1 (2013): 76-83. Vuksic, Tihomir, et al. “Stable gastric pentadecapeptide BPC 157 in trials for inflammatory bowel disease (PL-10, PLD-116, PL14736, Pliva, Croatia) heals ileoileal anastomosis in the rat.” Surgery today 37.9 (2007): 768-777.